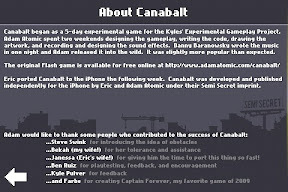 Canabalt (iTunes affiliate link), just like World of Goo comes from the Experimental Gameplay Contest, and turned into a quite widespread flash game. Below you can read my review of the iPod/iPhone port. 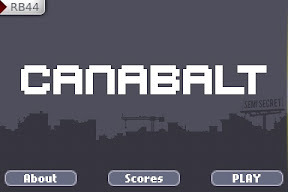 Canabalt is a simple game, both in concept and gameplay. 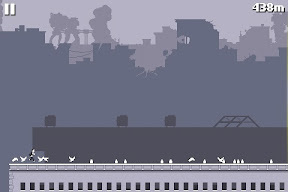 You play the role of a man running and jumping through rooftops, escaping of something unknown while jets fly in the background and buildings turn to debris. 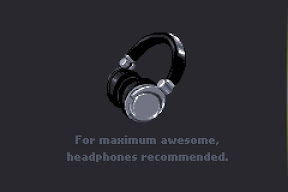 All mixed with a 'pursuit' soundtrack, very ambienting. 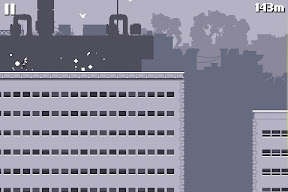 Gameplay consists 'just' on taping your screen to jump. Running is automatic, and you keep on gaining speed (and momentum) while you don't hit an obstacle. You may think 'how lame!' and more after learning that the price is 2.39€. But if you do, have a look at my post 'Price vs playability', and then play the flash version a few times. But before doing so, stumble this post, digg it or look at some of my reviews! 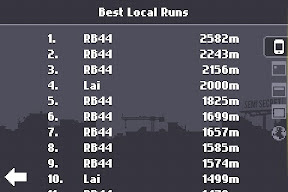 You start the game by creating a game profile, which can be local only (thus several players can beat each others highscores) or an account to keep a global scoretable. Daily, weekly, monthly and 'world' record tables are also available... You'll learn after a look on them that there are people with too much free time on their hands! 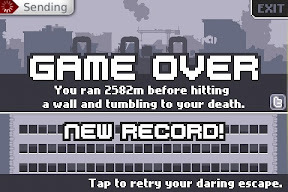 Also, keep a look for the "Game Over" messages, as they are quite fun, in some black humour sense. Don't overjump, try to land at the beginning of the next roof EXCEPT if the next building will turn into debris (they look differently, learn to recognise them). Keep your speed under control by avoiding and not avoiding (i.e. hitting) obstacles. If you want to improve a record, don't look at the distance meter. Definitely it is worth the price, although it should be priced somewhat cheaper.